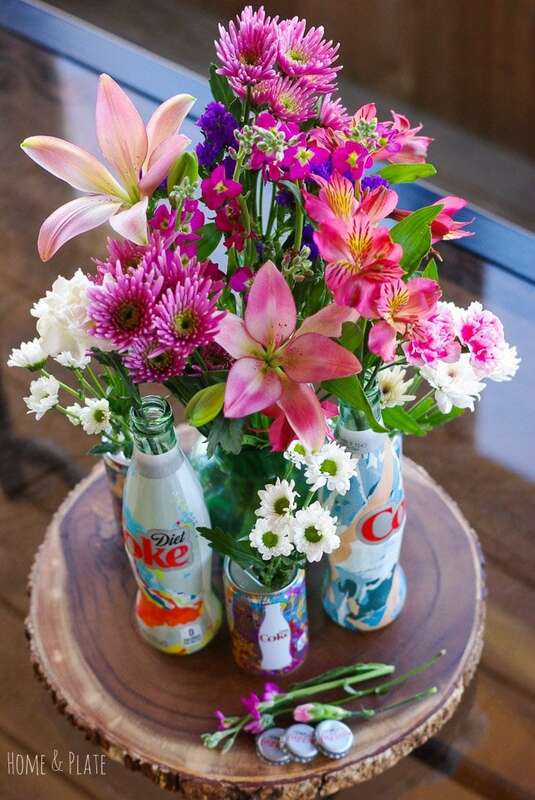 Create a colorful floral centerpiece using Coke bottles that makes a statement using a rainbow of flowers and a variety of containers. You can turn an ordinary bouquet of flowers into something spectacular. You don’t have to be an expert or professional when it comes to floral arrangement. You just need to be creative and know the basics. It doesn’t need to cost an arm and a leg. Being a Coca-Cola drinker I picked up a few bottles with the new design as well as a pack of mini cans. 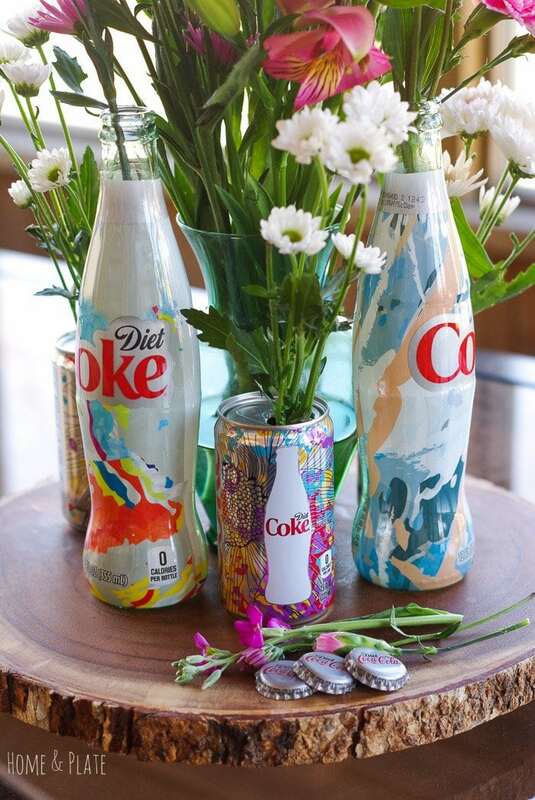 Don’t throw away these vibrant and colorful Diet Coke “It’s Mine” bottles when you’re done enjoying the bubbly refreshment. 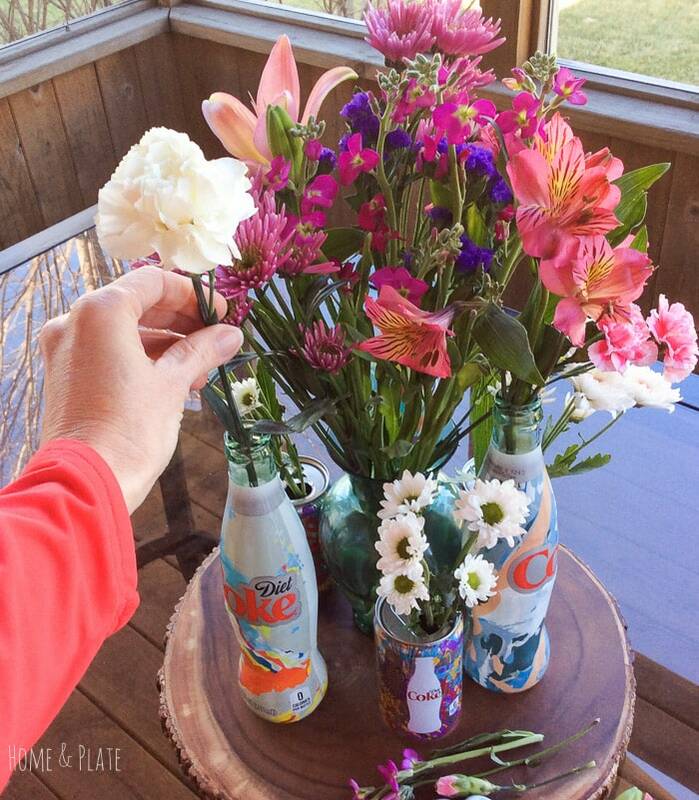 Repurpose these contoured individual bottles to make an ordinary bouquet of flowers look like something you ordered from the florist. 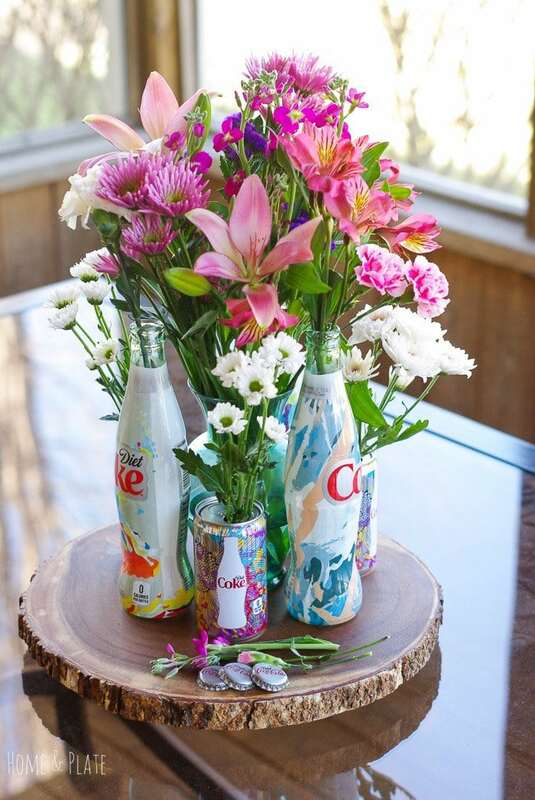 For this arrangement I grouped together three bottles and three cans around a small floral vase placed in the center to give the effect of a larger floral arrangement. 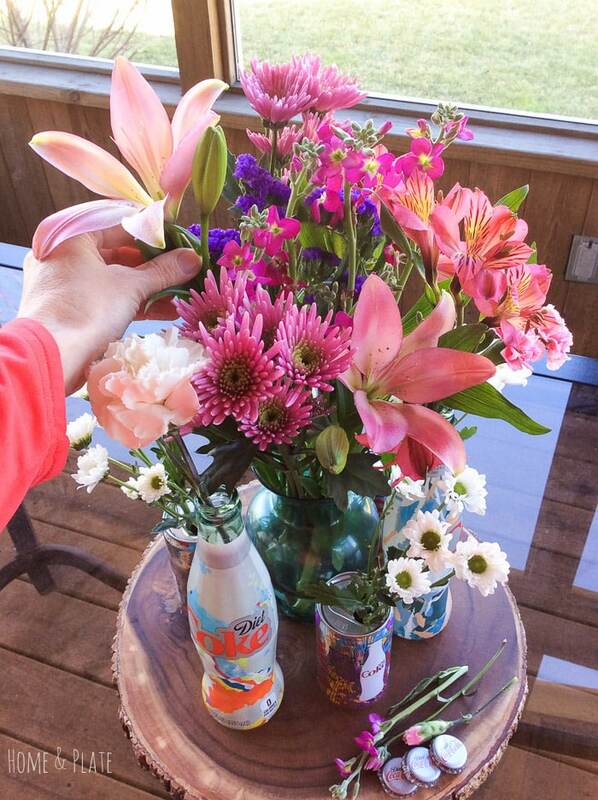 I chose a bouquet with vibrant colors that matched the bottles and cans. I picked up the flowers for $10 at my local Kroger. 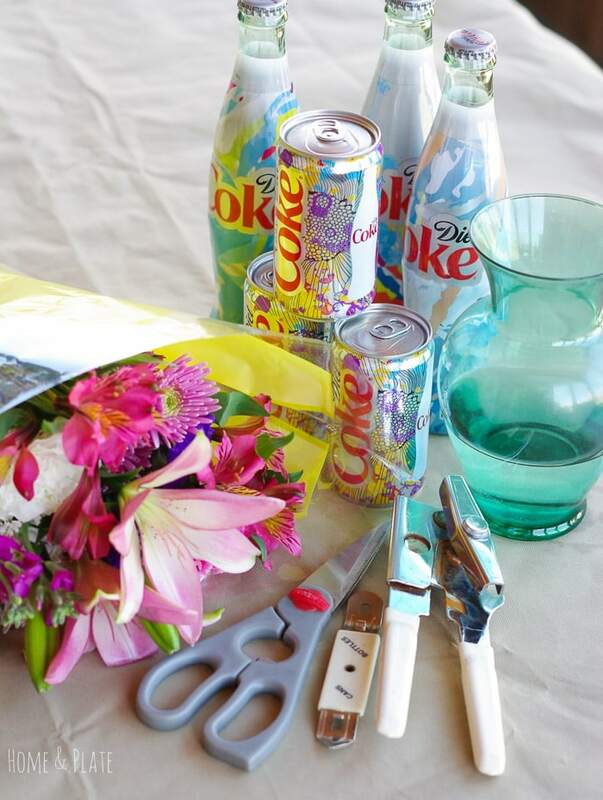 First, pour yourself a glass of Diet Coke “It’s Mine” to enjoy while you’re arranging your centerpiece. Next, be sure to rinse your bottles and fill them with warm water. It helps your flowers open fully. Trim the ends of each stem individually with sharp scissors or a knife before you make your bouquet. Arrange your bottles together to your liking. Add your heavier and thicker stemmed flowers first trimming to fit as you go. You’ll want to create height so add your taller flowers first. Then tuck in your smaller stemmed flowers into the open spaces. Cut your stems in varying lengths as you go. Use the depth of your container as a guide for how short to trim your flowers. I like to remove any leaves that would otherwise sit in the water. 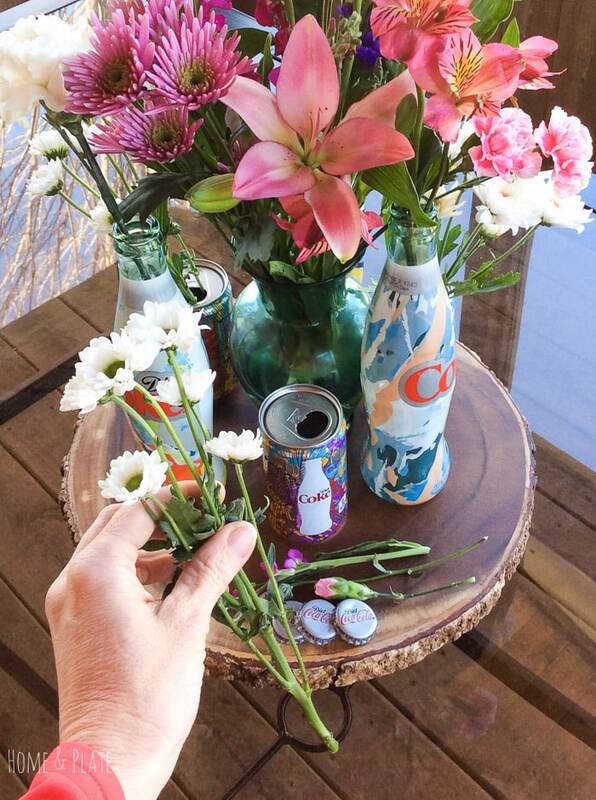 The cans and bottles have smaller openings than the center vase, so choose your flowers according. I fit in carnations, alstroemeria and daisies. It’s better to trim your stems as you go so you don’t cut them too short. Play around with the flowers as you go. If you don’t like the way it looks simply reposition the flower until it looks right to you. Once you’re done designing your arrangement take a look at it from all angles. Once you love what you see be sure to check the water levels of your containers daily. After all that work you don’t want to toss your flowers because they didn’t have enough water. These bottles are so pretty and no two designs are the same. I’m planning to save the bottles to use later. Strands of fairy lights would fit inside these bottles perfectly to provide a little ambient lighting for my screened porch this summer. 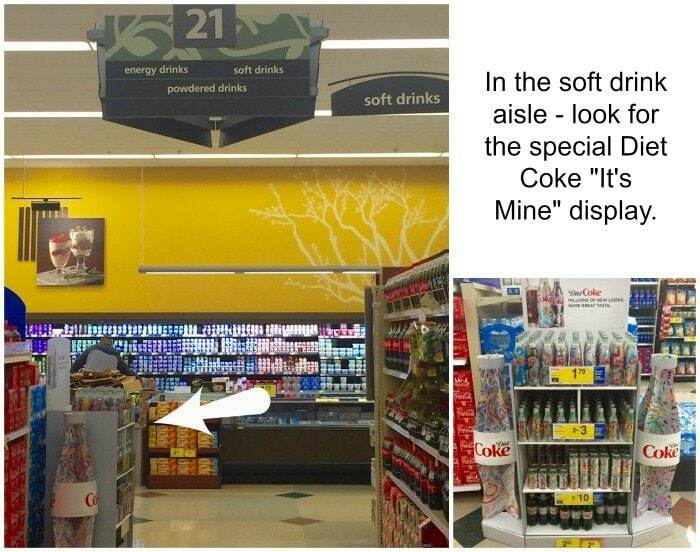 Diet Coke “It’s Mine” products are available for a limited time so hurry over to your local Kroger and pick up a few bottles to drink and repurpose. How will you use your bottles? Let me know in the comment below. These are so adorable. A great way to repurpose the bottle os that it doesn’t end up in a landfill – at least for a while. Love it! Thanks Cassie. I love finding unique containers for all kinds of crafts. 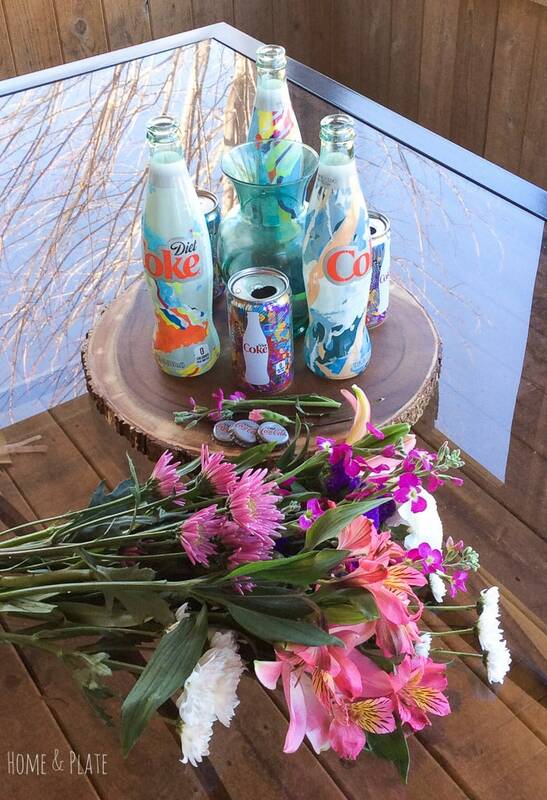 These Diet Coke bottles worked perfectly with the flowers. 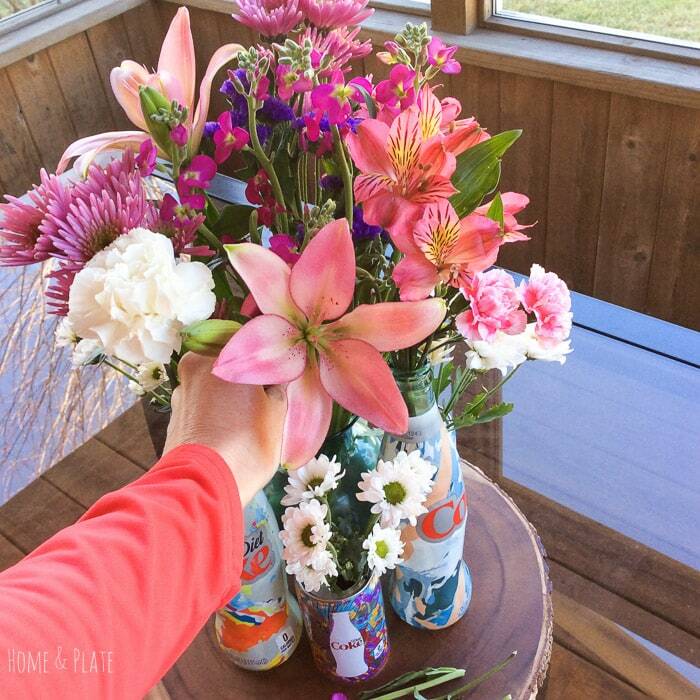 I absolutely LOVE those darling flower arrangements in those sweet and colorful Diet Coke bottles and cans! I’m all about color and beautiful whimsical things. 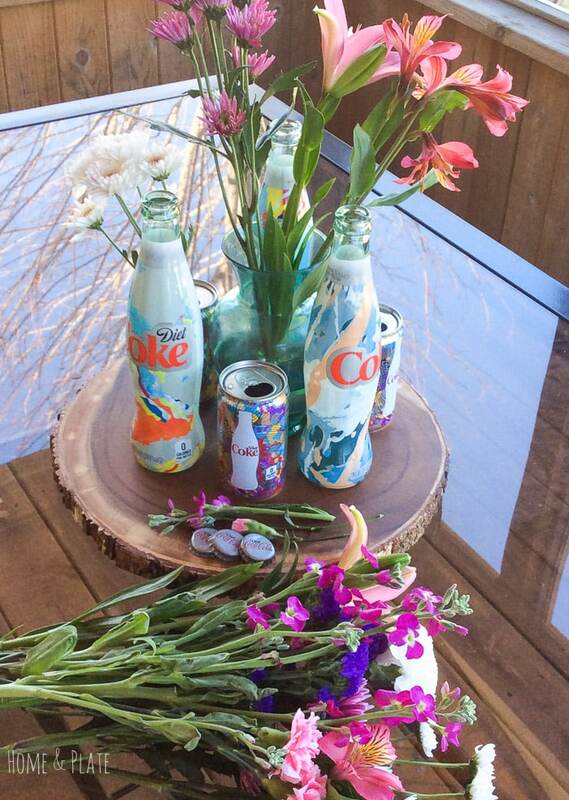 Spring is in the air and these Coke floral centerpieces are just my style! 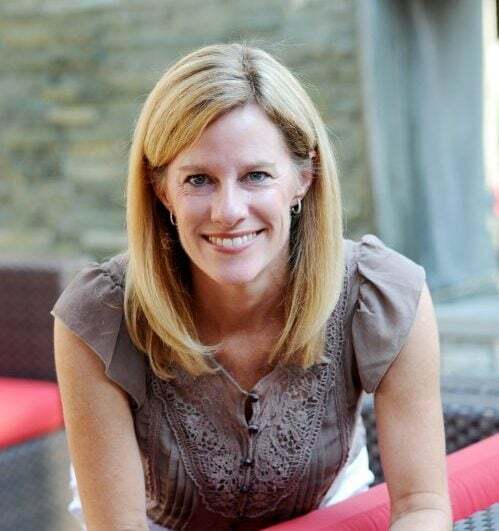 Thanks Denay….I am so ready for spring and love all the colorful flowers in the stores and coming up on our gardens. I’m hoping to reuse these Diet Coke bottles this summer with fairy lights. What a simple, easy creative and inexpensive idea on how to set a table. Love this, yep I’m doing this. Thanks Candy…adds such a great pop of color too. These are adorable and I never would have thought to use Coke bottles in this way! What a cool idea! 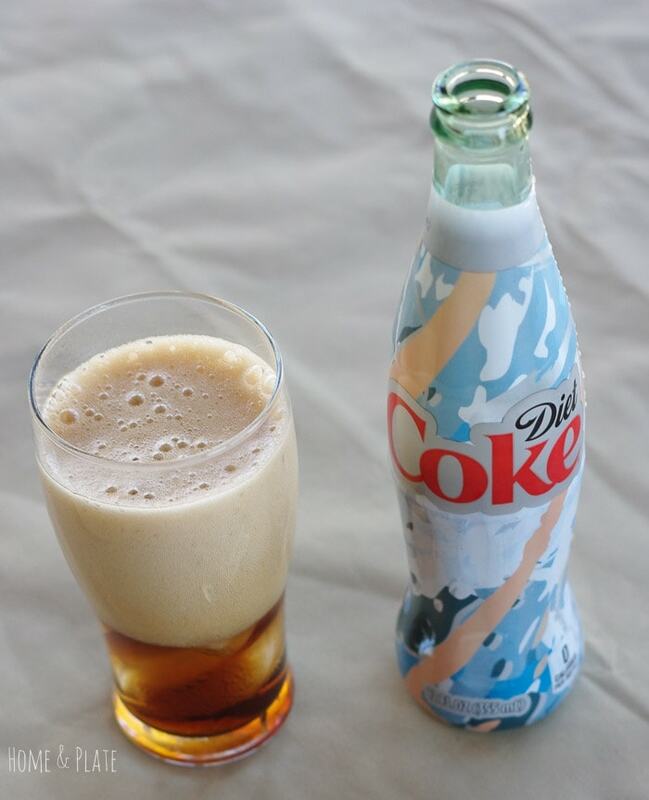 I didn’t know Coke has such festive, spring-like designs. You are so darn creative! Thanks Chrissa. 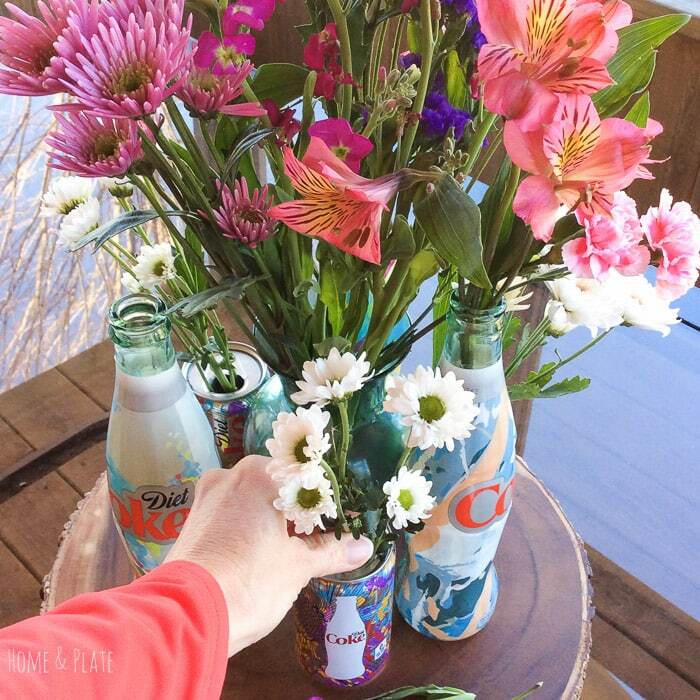 The bottles are perfect for a floral centerpiece. Easy enough that anyone can do it. What a creative idea! Very cute. Thank you so much. It was fun creating it.